Of all of John Eddleston's photographs of Blackburn, well the ones that have been published (about 200 of them in total), this is the only known coloured photo (though it appears in the book in Black & White). 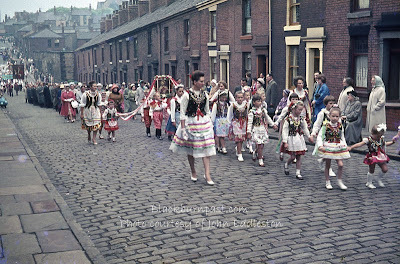 Taken in 1963, as far as we know, it shows one of the processions from St Alban's Church, as they make their way up Brookhouse Lane. 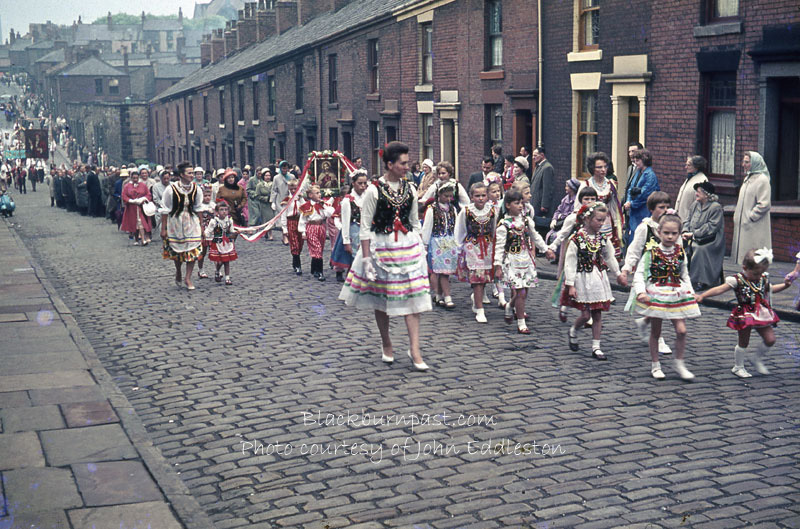 The caption in the book reads ''The Polish community of St Alban's Parish, in procession along Brookhouse Lane'' The traditional dress of the ladies and the children certainly looks Eastern European. I attended St Alban's School and took part in similar processions (well at least one) when I was about 6 years old. This procession is going in the opposite direction to the route we took. We left the church / school, walked up Whalley New Rd to Bastwell, turned left along Whalley Range and then left again down Brookhouse Lane and back to the starting point. Lots of these processions used to take place each year, most churches and their associated schools had them. Why does this one post get so many viewings? Each time I come onto here and look at the stats, this one has loads. 146 viewings in the last 24 hrs. My mum is in this photo. From what she's told me the Polish parade was not something she looked forward to! Why did your mum not look forward to it ?